A familiar face in the neighborhood will be missed. Fred Rogers took millions into his neighborhood and in turn, they took him into their hearts. The Early Show anchor Harry Smith reports Rogers launched his career in 1954 with "The Children's Corner." In 1968, he started what would eventually become "Mister Rogers' Neighborhood." Each day, he donned his trademark cardigan sweater and sneakers, and offered advice to help a young audience deal with difficult subjects. Fred Rogers was 74 years old. He died Thursday morning of stomach cancer. Most days, he would awaken at 5 a.m. and go for a swim, before coming in to the office. When asked how he felt when he put to bed the final program, Mr. Rogers said, "There was some great relief for me. The only thing that saddens me about not producing so many programs is that we really have a neighborhood of friends who help in the studio." The parts he enjoyed most he said, "Were the parts where I didn't have to wear the makeup and the contact lenses and the rest of that stuff." And there was still plenty to keep him busy. He was a much sought-after speaker and one of public broadcasting's most vocal proponents. He also found time to write a book, "The Giving Box." "There are lots of stories here from all over the world that tell about how people give and receive," he explained. "I would like to do a program for people who are just about to go to sleep and just read some stories. We've heard that this slow-paced voice of mine can put people to sleep," he said with a laugh. "So why not use it in that way?" With his gentle demeanor, viewers consider Mr. Rogers a caring friend. He received thousands of letters over the years. A letter that shows an example of his impact: "This person said that when she was growing up, she lived in an exceedingly abusive household where she was raped and scared every day. And she said the only time that she felt that anybody really cared about her is when she was watching us," Mr. Rogers said to Pinkston. On the occasion of the taping of his last show, he told reporter Don Cannon of affiliate station KDKA, "I think what I wanted to do was to give the message that there are many ways to say 'I love you.'" Though the neighborhood studio is dark, the bank of 1,000 episodes will continue to delight and educate future generations of children. Rogers leaves behind his wife Joanne, two sons, two grandsons and millions of fans who find the neighborhood a little sadder. Born: March 20, 1929 in Latrobe, Pa.
His father, James Rogers, worked at the McFeely Brick Co., one of Latrobe's largest employers at the time, owned by his wife Nancy's father, Fred McFeely. 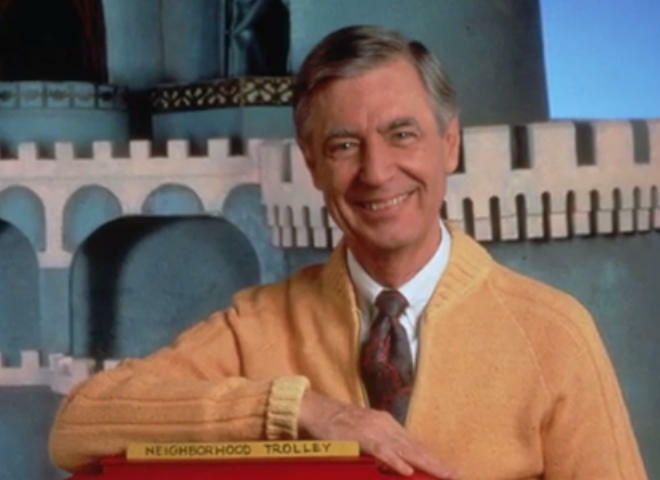 Fred Rogers has a degree in music composition from Rollins College in Florida and studied child development in the graduate school of the University of Pittsburgh. He enrolled at Pittsburgh Theological Seminary in East Liberty and was ordained as a Presbyterian minister in 1962. Prior to having his own show, Rogers was part of "The Gabby Hayes Show," "The Kate Smith Hour" show in New York and "The Children's Corner" with Josie Carey. He also created a 15-minute version of "Mister Rogers' Neighborhood" for Canadian television. "Mister Rogers' Neighborhood" began as a regional public TV program aired on WGBH-TV in Boston. And it aired on PBS stations across the nation in 1969. He is the voice behind King Friday XIII and Queen Sara, rulers of the neighborhood, as well as X the Owl, Henrietta Pussycat, Daniel the Striped Tiger, Lady Elaine Fairchild (named for Fred's sister, Elaine) and Donkey Hodie. The cardigan sweaters Rogers wears on his show were knitted by his mother and have become his trademark. One of them is even part of the Smithsonian Institution's Museum of Natural History in Washington, D.C.
"Mister Roger's Neighborhood" has won three Emmy Awards and Rogers has been honored with the George Foster Peabody Award. He is the author of: "The New Baby : A Mister Rogers' First Experience Book"; "Mister Rogers Talks with Parents"; "The Giving Box: Create a Tradition of Giving with Your Children"
He married his college sweetheart, Sara Joanne Byrd, a concert pianist.